Leo was due to start at the local crèche in Monchique at the beginning of September. I had decided that I would take him there for three afternoons per week while I went to the library and did some work. Good for him, good for me. It didn’t go quite to plan. His age group (12-24 months) sleep from 12.30 – 2.30 (even though Leo still sleeps in the morning and afternoon) so I got there at 2.30 when the little ones were waking up. Only some of them were twice the size of Leo. With long hair and big feet. But I was assured they were less than 24 months – just, as it turned out. It took about half an hour before I managed to unclamp Leo’s fingers from my arm and put him on the floor with the others. I got some mismatching rings on a little plastic pole – similar to something he has at home and sat down with him on the floor. The room was stifling. The woman in charge opened the window but no air seemed to get in. The other children were somnolently wandering around holding pieces of plastic vegetables. One little girl with corkscrew dark curls pushed a pram with a one-armed human-like doll. The girl smiled but her eyes were tired. Leo looked in horror at a pile of dolls with broken limbs and went instead for an aubergine. A blonde-haired boy came and snatched it from Leo so I snatched it back. That is to say, of course, I gave the other boy a potato and Leo the aubergine. No one spoke apart from the staff as they changed nappies and chatted to each other and monologued with the little ones. ‘Come here, Maria, it smells like you’ve done a poo, come on, let’s change you…’ The children didn’t answer but as soon as they were released continued pacing the room. One by one they were sat down and given a yogurt. Not one of them tried to wriggle away –unlike Leo, who tried to climb out of the window. It reminded me of a scene from ‘One Flew over the Cuckoo’s Nest’ – except with little people. 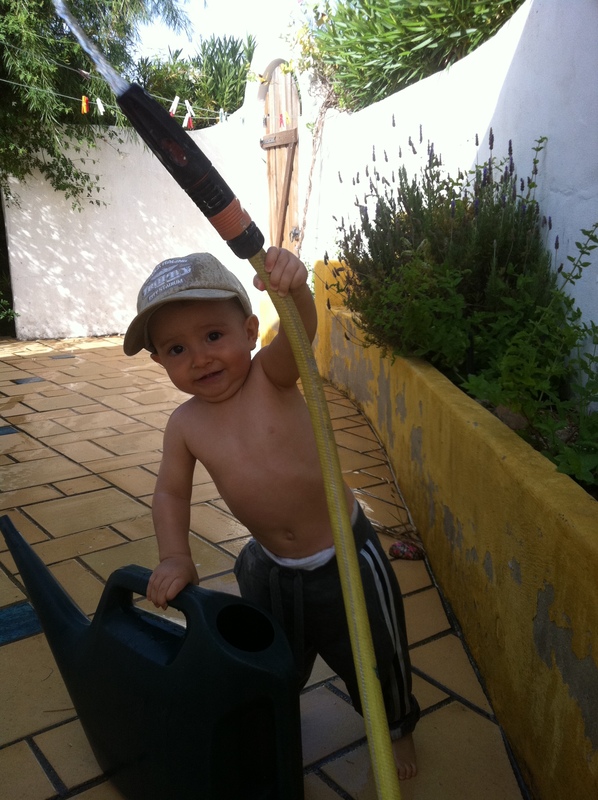 Leo loves water, which he calls ‘tea’ and he always plays with the watering can at home – both a toy and a real one. I found him a toy one and he happily took it and went to a tap and turned it on. But the tap wasn’t real. Leo looked up at me, with saudades in his eyes, and said, ‘Tea? Tea? Later, at home, thinking it would be fine, it was just for a few hours a week in the afternoon, my iPhone rang. ‘But what about mums and dads who work in the afternoon?’ I asked. I said I would call her back. Now I don’t know anything about crèches or child pedagogy but surely it makes sense for the parent to spend as much time as possible with their child and for the crèche to try to accommodate that? 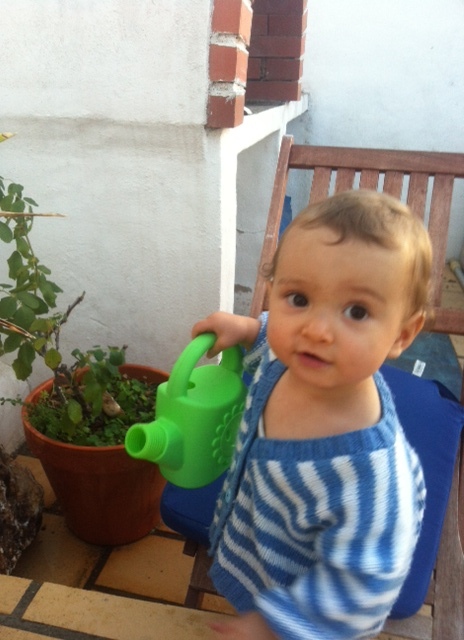 I paced around the terrace at home wondering what to do while Leo happily played with his real watering can and real ‘tea’. I thought that maybe two days a week from 10-3 pm would be okay. He ignored me and went on playing with his watering can. I went into the kitchen to get a real cup of tea. I decided I was being silly, suffering from separation anxiety. I would call the crèche and book him in for two days a week. Just then Leo let out an ear-piercing screech. I ran outside and found him pointing to the fenced-off water tank aka swimming pool – two square metres of tea. ‘Tea, tea!’ he said. There was an unusual sense of urgency in his voice. I looked in and there was my iPhone lying at the bottom of the pool floor. I screeched, opened the gate, jumped in fully dressed and retrieved it. It was, not surprisingly, drowned. Leo went on happily playing with his watering can while I tried to give my phone the kiss of life. Miraculously, after a few hours and some gentle massaging with a dry towel it came back to life. That is to say the internet and camera work, as does text messaging, but unfortunately the phone itself gurgles and then goes dead. So I was never able to call the crèche. This entry was tagged creche, doubts about creches, iphones dropped in swimming pools, Monchique, one year old. Bookmark the permalink. I’ve been meaning to reply for ages, Nicola, but no creche, no time! I tried again with Leo at the Monchique creche week and I have to say, despite my doubts, it is very good in terms of structure and lots of activities. The first day they did an exercise about what they did the day before (unfortunately Leo doesn’t really speak) and then did a drawing, the next day a story and a painting. I assume that was why they didn’t want me to go in the afternoon. But they were happy for me to go however many or few mornings I wanted. Unfortunately, Leo did not like it and was very disruptive. He would not sit in a circle with the others and marched around the room picking up toys and throwing them back down. All the other kids quietly sat and listened. The first day I stayed with him for an hour and then left him for half an hour. For the next two mornings I tried, I could never leave him again – not even to go to the toilet without big screams. I wouldn’t mind but I can leave him with most other people without a squeak so it’s not for him. I don’t know why. There were a lot of children – maybe twelve and sometimes only two people in the room. It’s very enclosed. The teacher is great but quite strict and they are constantly telling the children off for putting fingers in their mouths. Leo is 16 months and he puts his fingers in his mouth when he’s teething. But I have to say the kids were really well behaved and none of them were crying. But I just couldn’t do it. So back to square one. Agh!